Media: Soft, glossy, laminated card, colour covers; A4 portrait format on 136 semi-gloss pages (8 in colour). Includes 16 colour artworks and 211 photographs. Advantages: Superb study of the Royal Navy's longest-serving and most versatile aircraft, by the people who flew and operated them. Outstanding collection of mainly unpublished black and white photographs. “There are old pilots and there are bold pilots, but there are no old, bold, pilots” is an oft-quoted aviation maxim and one that is used in this book whilst alluding to the subject matter's general unsuitability for aerobatics! 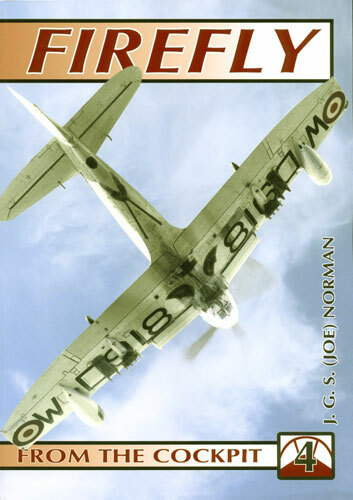 'Firefly - From the Cockpit No.4' by J. G. S. (Joe) Norman, is the sixth volume to be published in Ad Hoc Publications' superlative series and covers the Fleet Air Arm's longest serving aircraft, the Fairey Firefly. This new book brings a new author to the series, in the form of Lieutenant Commander J. G. S. (Joe) Norman, a retired Royal Naval engineer officer. Experienced on many types in the postwar Fleet Air Arm, he flew Fireflies with 796 Squadron (Culdrose, UK) and 728B Flight (Hal Far, Malta) where he was also in charge of the Station Flight. Qualified for some time as a Maintenance Test Pilot, he had the 'honour' of carrying out the final test flight of a Firefly drone from Hal Far. With such a rapidly expanding and consistently excellent series, it becomes increasingly difficult for a reviewer to find something different to say and avoid repetition. Thus, as before, seven chapters explain the key aspects of the Firefly's development, operation and service history. 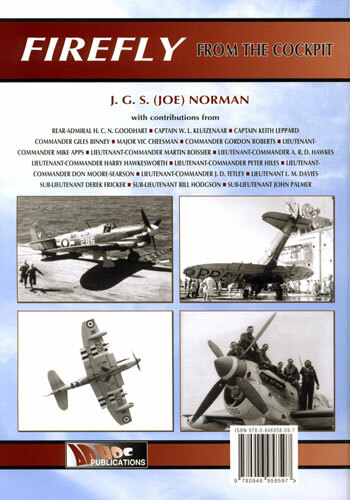 The author's words in each chapter are accompanied by the personal recollections and experiences of former pilots, engineers and specialists, with the final chapter covering the various Naval Air Squadrons with which the aircraft served. These detailed recollections, allow the reader to appreciate and understand what the Firefly was like to operate and fly, during a long career spanning World War II, the Malayan Emergency and Korea. Whilst the written information is captivating enough, it is (as usual) the exceptional black and white photographs, many of them unpublished, which mark out this series. To say that these images are superb is an understatement. From the modestly 'chinned' Mk.1, through the thoroughbred-looking Mk's. 4, 5 & 6 and culminating in the 'gaping-mouthed' Mk.7, all aspects of the Firefly's career are illustrated here and in detail. Colour also makes an, albeit subdued, appearance, with three pages devoted to the story of the saving and restoration of Firefly 'WB271', of the Royal Navy Historic Flight which, tragically, was lost with both crew members during a display at Duxford (UK) in July 2003. To round things off, there are also four pages of colour artwork profiles (16 in total) covering various service aircraft, including a two-page spread of drone Firefly U MK.9 'WB391', as flow by the author with 728B Flight, RNAS Hal Far, Malta, in October 1961. At sea, single-purpose aircraft are a luxury. By the very wide-ranging nature of the missions undertaken and because of the severe limitations of space aboard an aircraft carrier, naval aircraft have to be adaptable. Fairey Aviation's Firefly was, as the book points out, a 'multi-rôle' aircraft long before the term was coined. Inevitably, as the tasks increased and the engines and ordnance got bigger and heavier, the performance suffered. Despite this however, the Firefly proved to be an adaptable and versatile machine, enjoying a long and distinguished service career, the like of which was not replicated until the modern jet era. Continuing the high standards set with earlier titles in this series, 'Firefly - From the Cockpit No.4' will not disappoint either the casual reader, the modeller or the historian, who will all find much to satisfy them. Apart from the very informative text, modellers will particularly appreciate the splendid detail in many of the photographs reproduced (e.g. the useful shots of the target-towing TT Mk.4). With three more Fleet Air Arm aviation subjects slated for publication in early 2008, this series from Ad Hoc just keeps getting better and better.